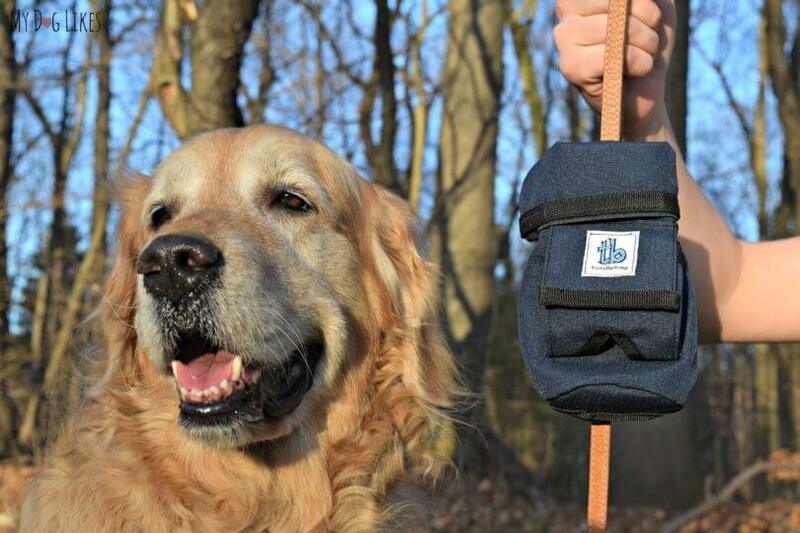 Turdlebag Leash Attachment - Hands Free, Stink Free! 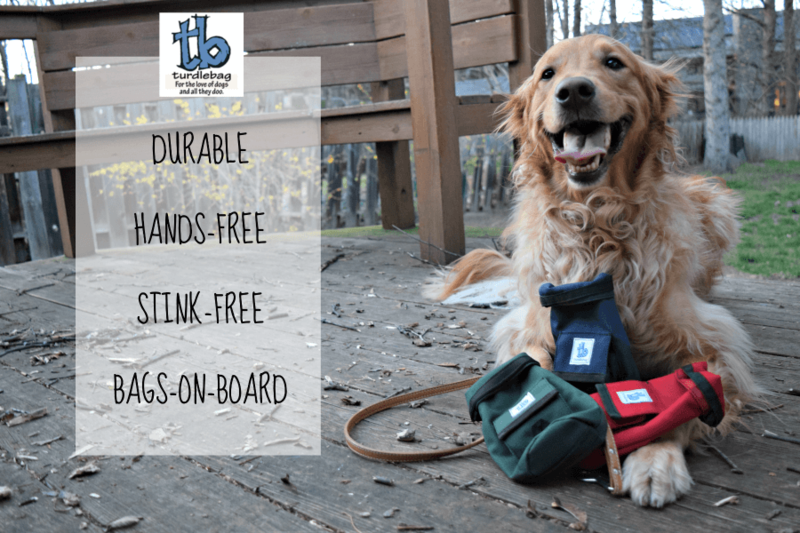 Turdlebag Leash Attachment – Hands Free, Stink Free! We are always on the lookout for any accessories that will make a dog parent’s life just a little bit easier. That is why we are so excited to let you know about Turdlebag – a company with a very creative solution to a stinky problem that we all face! 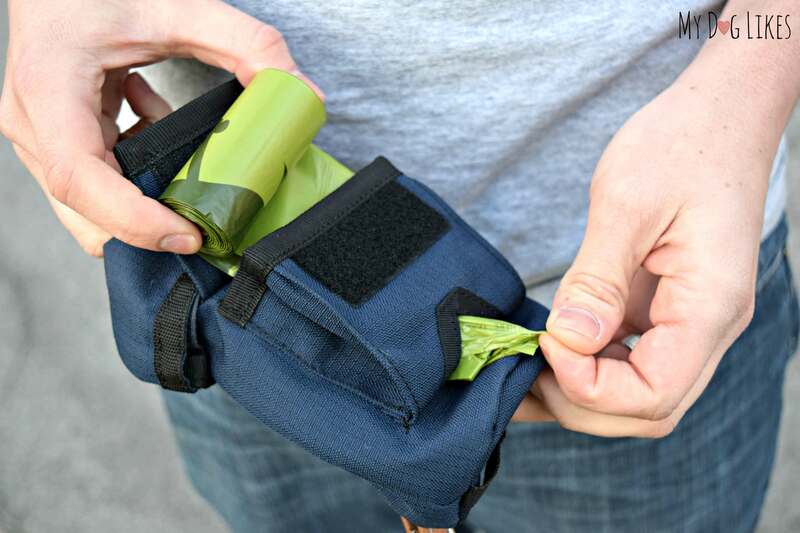 Simply put, the Turdlebag is a convenient leash attachment that holds (and conceals) used bags of dog poop. How often does your dog choose to do his business near a garbage can? I’m guessing almost never, and nobody likes carrying around a poop bag for miles. Especially when you already have your hands full wrangling dogs and trying to keep leashes from getting tangled. Not to mention the awkward encounters with friends and neighbors while you literally have a bag of poop in your hand! 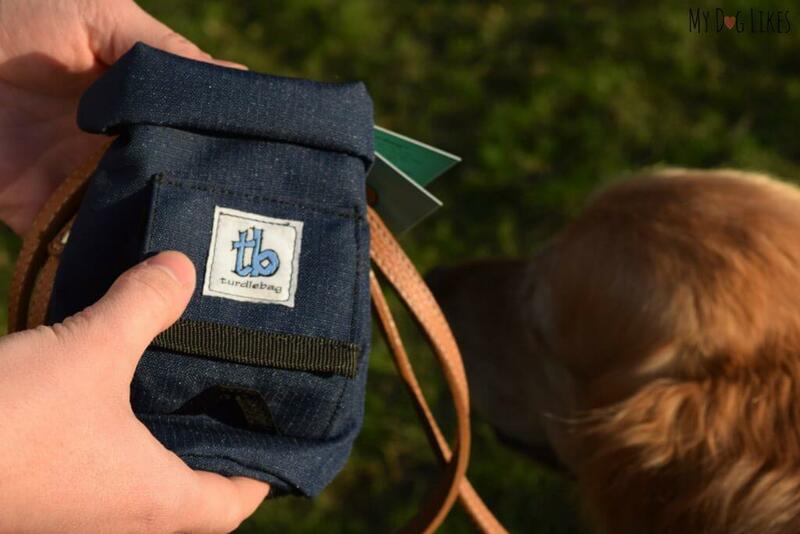 Turdlebags are the brainchild of regular dog owners who were tired of the inconvenience and awkward moments involved with carrying around dog waste. The very first “Turdlebag” was sewn by hand for personal use only. Shortly after they began using it on daily walks. It wasn’t long until they found themselves being asked about it. Everyone was requesting one for themselves! Since the interest and need was clear, they decided to take their invention to the next level! After putting some more time into the design and features, Turdlebag was officially born! 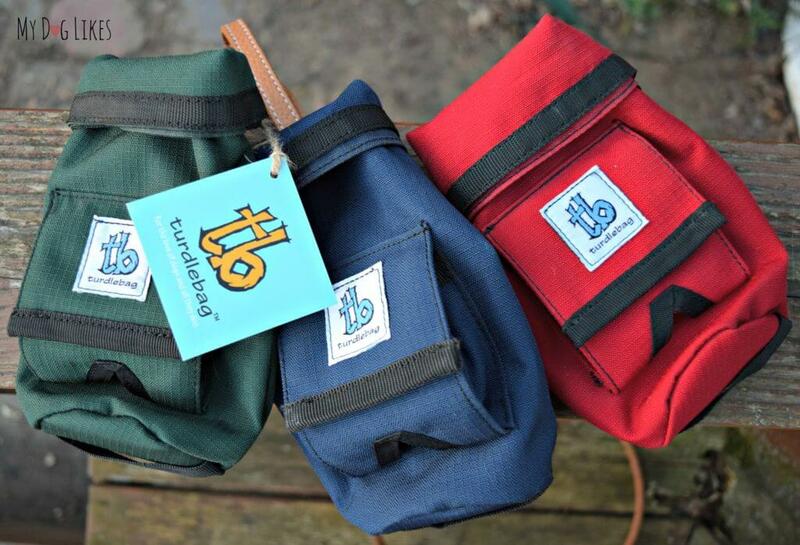 TurdleBag comes in 3 classic colors: the folks at TurdleBag were kind enough to send 1 of each to test out and share our thoughts with our readers. While the product may seem simple at first glance, the TurdleBag has several clever features that really make it stand out. Attaches to nearly any leash: Whether your leash is round or flat, wide or thin, it is almost certainly compatible with the Turdlebag. Unique buckling system to contain odors: The pouch contains extra material at the top allowing it to be folded over and then snapped shut with a buckle. Not only does this keep the dog waste inside but all of the odors as well. Machine Washable: The Turdlebag is constructed of a durable canvas-like material that can be put right in the washing machine. Such a great idea for a product that does a dirty job! Large Receptacle: The pouch is large enough to handle multiple bags of dog waste. Poop Bags Included: Not just any cheap poop bags either, but our favorite Earth Rated poop bags! First, slide the end of your leash through the loop on the back of the Turdlebag. (Optional) Roll down the top of the pouch towards the front and attach the buckle around the back. That’s it! Your Turdlebag is now secure! Empty: Undo the buckle, unroll the top and grab the handle on the bottom. The poop bag will fall right out into the garbage can. You don’t have to touch it again!! Each Turdlebag comes with attached instructions which made it a breeze to install and use. Attaching the TurdleBag only takes a few seconds and we love that it accepts nearly any type of leash. The TurdleBag feels very secure once attached, and you will note that it does add a bit of weight to the leash. In our opinion this was a good thing as the leash felt more balanced in our hands. Since the TurdleBag attaches directly to the handle of the leash we had some initial concerns about it getting in the way when we needed to choke up on the leash. After a bit of awkwardness at first, we quickly figured it out. While you won’t be able to wrap the leash several times around your hand like you may be used to, forming a large loop will allow the TurdleBag to hang unobtrusively and give you more control when your dog needs a shorter leash. The TurdleBag has a very large opening, making dropping the used bags inside easy. We were very impressed with the storage capacity! The TurdleBag had no issues containing the waste from 2 large dogs. It is a good idea to knot the bag as far down as possible to avoid entrapping extra air and save on space! The TurdleBag was simple to roll down and snap closed. This keeps the waste inside, but what we were most impressed about was how well it retained odors as well. We didn’t smell their business for the remainder of the walk! This part really could not be any easier and we were amazed that they devised a way to empty the TurdleBag without requiring a second handling of the poop bag. The handle on the bottom is conveniently placed and the wide opening allows the waste to fall right out with no issue. The Turdlebag designers really have thought of everything. Not only does this contraption keep your hands free of carrying poop, but it has a built in bag dispenser for convenience and can be emptied without touching. One of our absolute favorite features however is that the top rolls down to contain odors – and does this job surprisingly well! The Turdlebag eliminates an annoyance that we all have faced, looks great, and helps to make walks that much more pleasant! 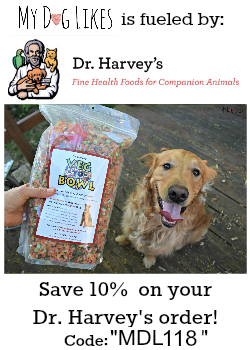 It also makes for an amazing gift for any dog lover! 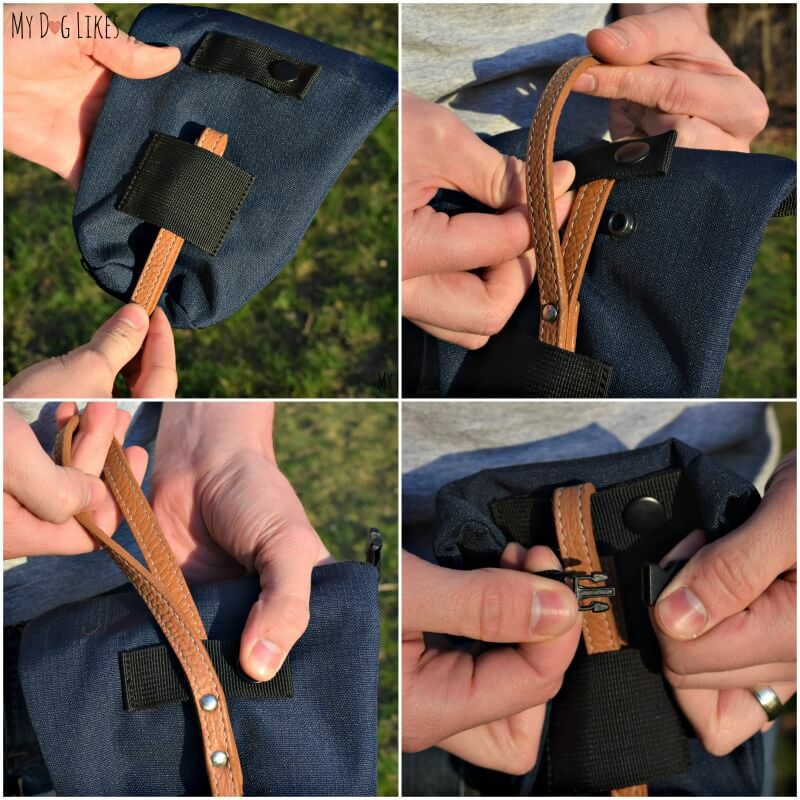 How would you like a Turdlebag to make your walks easier? Click Here to Pick Up Your Own! I love how handy and hands free this bag is!! Oh I’m liking this product! Why is it they never do there business until they are the furthest away from a garbage can? Lol! Sounds like a great, functional product! Great review! I like that it can be dumped without actually touching it. Looks like a real handy tool. I guess with that snap, you could attach it to a pack or loop too if the leash isn’t the right place. 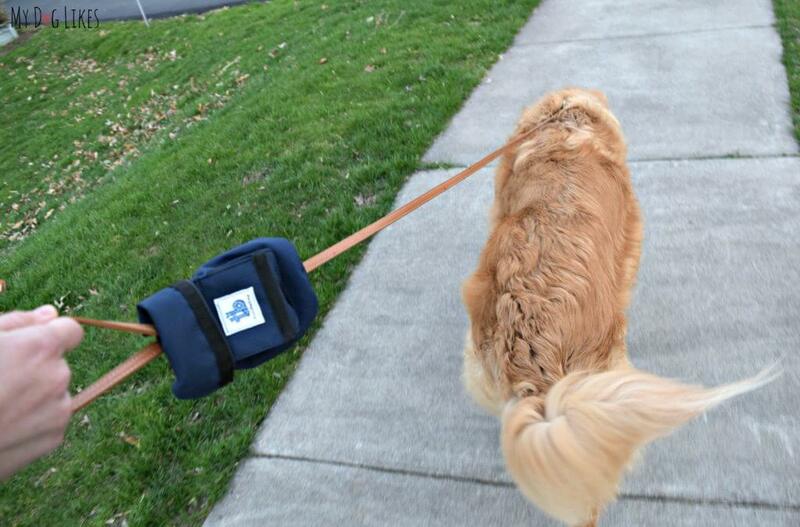 I like the hands free leash attachment & the waste bag roll storage compartment features the most What a great product!!! Fantastic idea for dog owners!! I love how I do not have to carry a little bag around for our entire walk!! 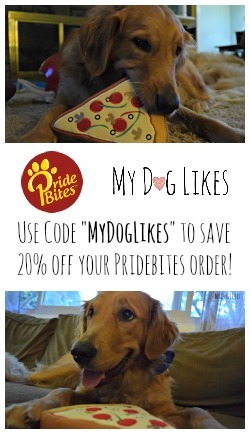 This is great for multiple dog owners too! Excellent idea!! Awesome tool for big dog owners! I like that I can hide away the filled baggy while I continue my run with my pup. I love the blue one! 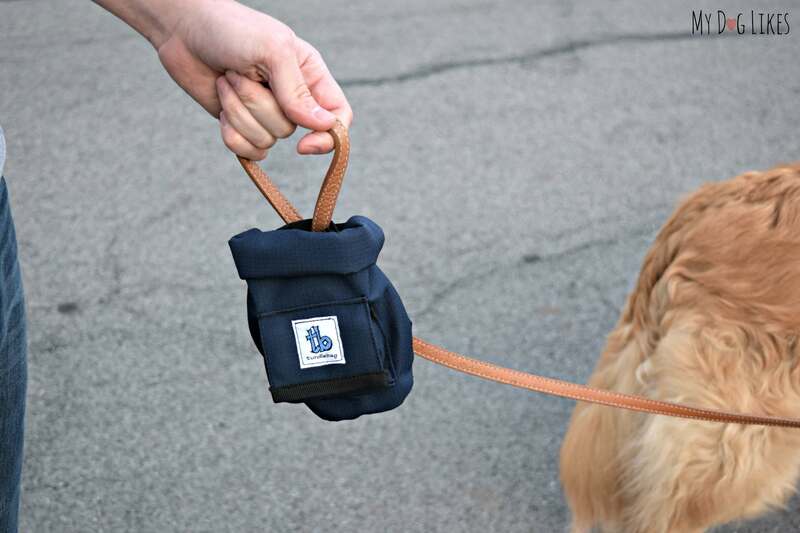 It would be great having a Turdlebag Dog Leash so everyone I passwon’t know Schooner or Skipper is carrying the poop bag! sounds like an interesting product! our dog’s poop doesn’t really smell but it’s never nice to have to carry the poop. I also wonder if it’s a way to carry other stuff if we get two seeing as we have two leashes for our two pups? (1 for poops, 1 for non-poops) Does a Iphone fit in it? That’s a great idea! An iPhone would definitely fit inside and you could probably fit keys and some money as well. This sounds great. I like that it holds the poop bags and they just pull out. I so love this, its great for every age and I so love that you can get rid of the dog poop without touching it. Its just made my life with 2 dogs that so much easier. That is one of our favorite features as well – you don’t even have to handle the bag a second time! Awesome Idea! My dogs always go right in the middle of the walk and I have to carry it all the way home. This would make the rest of my walk more enjoyable! My favorite feature is the large opening to deposit the full poop bag into! Doesn’t it seem like they know just when we are furthest from home (or a garbage can)!! ? 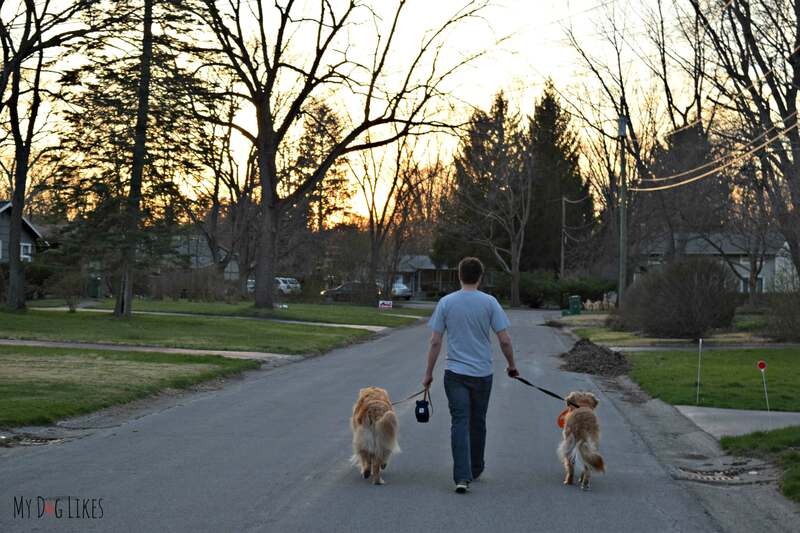 I love the hands free idea, and that it gives me a place to carry the poop instead of lugging around a bag. Fortunately I often follow a route that has a lot of garbage cans along it. But, when I don’t, I hate carrying that bag. I love the fact that you dont have to just walk around carrying the poo! I love how durable it seems, machine washable, and that it doubles over so you can’t smell it. I’d also use it, when not used for waste, to put training treats in since my “pup” is in obedience classes and I need a treat holder. Thank you for the giveaway. That is a good idea – this would make for a great treat pouch for training! I love the hands free feature. This looks like such a good idea! Can’t wait to try it. This is a nifty solution to a problem most of us have! My favorite feature (besides the fact that it’s carrying the bags!) is that it carries empty bags! I always need to bring some, and it’s nice to have one thing that does all jobs! I love this!Would make it so much easier to always have poop bags along and not have to smell it. I like the Emptying feature best. The feature I like the most is that it holds both the roll of bags and the bags once used on the leash so I have a place for both, not on my person. 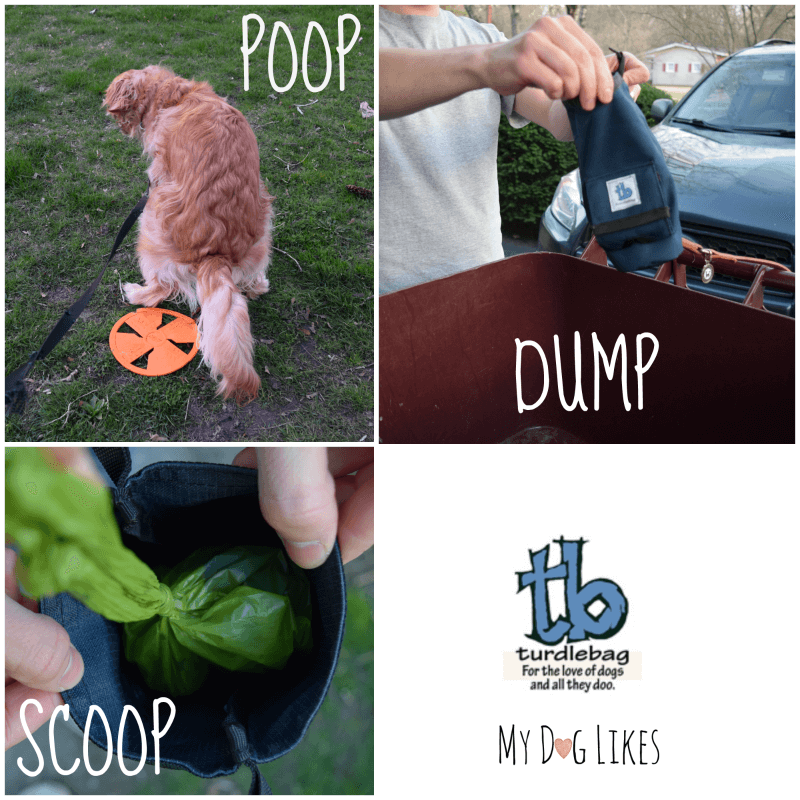 Turdlebag appears to be an excellent dog poo product! I like that I will no longer have to have a bag of poo in my hand for the duration of my dog walk. The built in bag dispenser but its overall pretty cool (for a poop bag). I like that it is so easy to empty while keeping your hands clean as well. A walk where I don’t have to carry the poop for the rest of the walk?!?! That’s fantastic! I like that the turdlebag is hands free. I have two dogs. When I walk it is enough to have to hold onto the two leashes. We just added another pup to our fur family so this will be awesome when walking them both, I wont have to worry about that and the dogs. What a very clever accessory!! I love that it comes with the Earthrated poop bags – they are also my favorite ones 😉 I really like the green colored Turdlebag. Earthrated poop bags. it leaves your hands free, since i have 3 girls to walk. i also like that i am not walking around looking for a place to dump the bags and can dump them all at once without having to touch them again. i like the red one the best as well. When I walk my dogs I have to carry the poo bags all the way home because there are no trash cans where we walk. This is such a great idea! I can put it in the holder so I don’t have to look at it for miles. I refuse to just pick one lol…I really need this in my life!!! 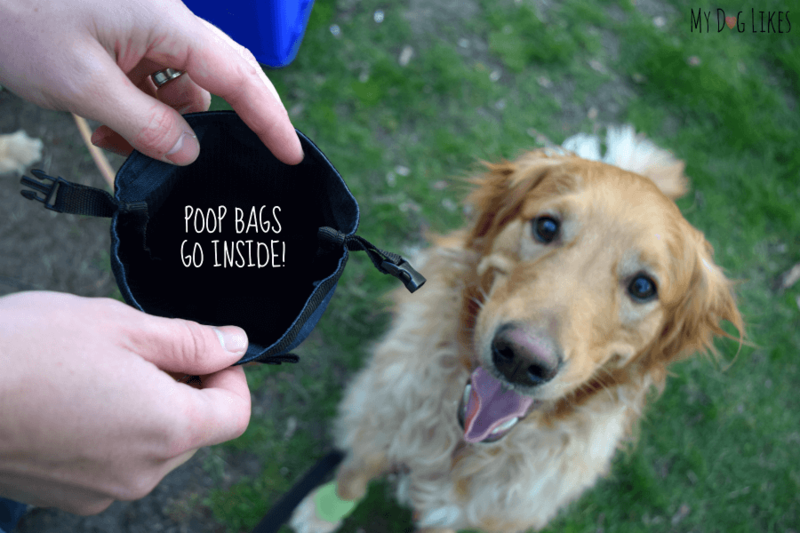 I love the idea of not having to carry around a bag of poop in your hand and its hidden in that bag and it keeps the odor away too! Awesome idea! I know people who have broken their hand from leash related injuries from wrapping the leash multiple times around their arm & then their dog pulling after a squrrel….so preventing wrapping multiple times is actually a good thing! I like that the bag is right on the leash, leaving a hand free. I love that it can be washed and dryed if needed & I love how easy it is to discard your package! I like everything about it really, this would be very handy. 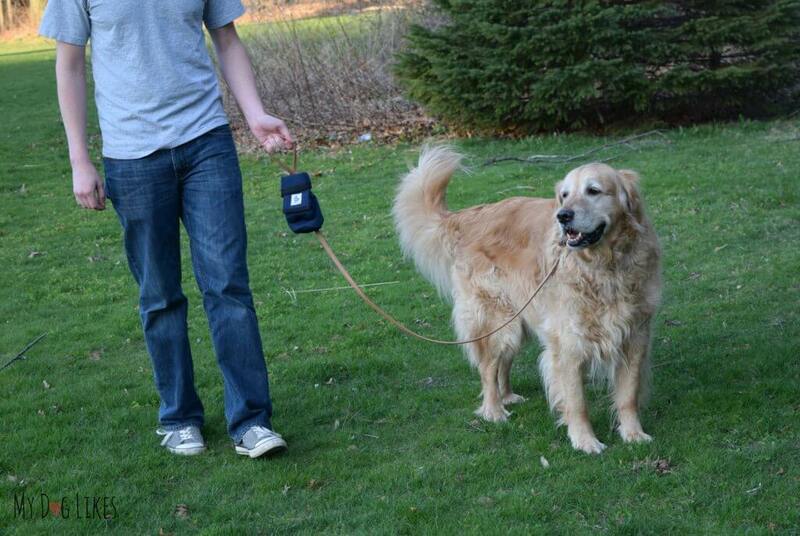 I like that it’s hands free, so no more carrying dangling poop bags for the rest of our walks! My favorite features are that it’s machine washable and it attaches to the leash so I don’t have to carry it. I like that it holds the bags for when needed. I like how easy it is to empty. I like that it is sturdy and a good size. My favorite feature is that it seals up the odor. I have a clip for poop bags on my leash, but it does nothing for the smell. This would be better!